Yorkshire Terrier is a small sized dog. It is also known as a toy-dog because of its delicate looks that appeals numerous dog lovers. It is industrialized during the 19th century in Yorkshire, England. General appearance: One of the major characteristics that distinguish the Yorkshire Terrier from other dogs is its long hairs that is enough to grab the attention of the public. They have a black nose with level bite teeth. Its ears are v-shaped and have a medium length tail. Its shoe-button eyes with a smooth and silky coat are most adorable features. 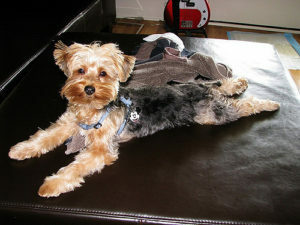 Normal size and weight of the dog: There is no height standard and an adult Yorkie’ height is between 6-9 inches. Yorkies are generally 7 pounds in weight while some of the breeds are up to 15 pounds and love to spend maximum time on the ground. Colour of the dog: Its blue and tan coat covered the entire body from the base of the skull to the tail and falls straight down on both of the sides of the body. Generally, the coat color varies from dark gray to black but in some dogs, the coat color is tan with a blue saddle. Some of the breeds have brown and golden coats. Temperament: Yorkshire Terriers are quite energetic, loyal and brave. Such dogs proved to be an outstanding companion if the owner knows to treat them in an appropriate manner. They might be aggressive to strange dogs. Attention seekers: At times, Yorkies develop jealousy as they need a considerable amount of human attention so the owner should treat the dog as needed. Yorkies are intelligent: It is quite convenient to train the dog as it is an amazing watch dog by nature and very smart and quick to learn. As they are working breeds so it is good for their mental and physical health to make them busy in various indoor games or training. The dog gets anxious when it doesn’t get appropriate boundaries. It is the best choice for the families as it can be trusted with children. Health issues: There are many health-related problems with Yorkshire Terriers which include early tooth decay, digestion problem, eye infection, bronchitis, patellar luxation, cataracts, and so on. Yorkies have poor tolerance for anesthesia. Good breeders genetically test their breeding stock to avoid any disease in the future. Life span of Yorkies: The overall life span of Yorkies is 13-20 years and small sized dog’s life span is comparatively shorter because they are more vulnerable to various health issues.